Tonsil stones, also known as tonsilloliths, are caused by the accumulation of debris in the crevices of your palatine tonsils. These lymphatic organs are located on either side of the back of your throat. If you suspect that you may have tonsil stones, you can perform a simple at-home throat examination with a few supplies. Each tonsil has a covering of pink mucosa that is lined with a system of channels and pits called the tonsillar crypts. When bits of debris such as food particles, dead cells, and microorganisms become lodged in these crypts, the resulting accumulation can combine with mucus and begin to decay. The decaying material then calcifies into small, hard pellets in the tonsillar crypts. If you suspect that you may have tonsil stones, you can conduct a simple throat examination at home. Using a mirror and a flashlight can allow you to inspect each of your palatine tonsils for any obvious white spots or flecks that would indicate tonsil-stone formation. Take a clean cotton swab and pull back the flaps of your tonsils to inspect them more thoroughly. Be careful when performing this DIY throat examination, as you may trigger your gag reflex or poke sensitive tissue accidentally. Although this DIY throat examination can be helpful in identifying obvious tonsil stones, the only definitive way to determine whether you have tonsil stones is via imaging such as a CT scan or an X-ray, as these methods can indicate the presence of stones that may not be visible otherwise. Most individuals who develop tonsil stones do not experience noticeable symptoms, as the majority of tonsil stones are small and not problematic. Some patients, however, may suffer from large, more-solidified tonsilloliths that cause bothersome symptoms such as a chronic sore throat, earaches, difficulty swallowing, and persistent bad breath. This form of large tonsil stones is rare but can be very uncomfortable. If your tonsil stones are bothersome or are giving you reason for concern, you may need to see your family doctor. 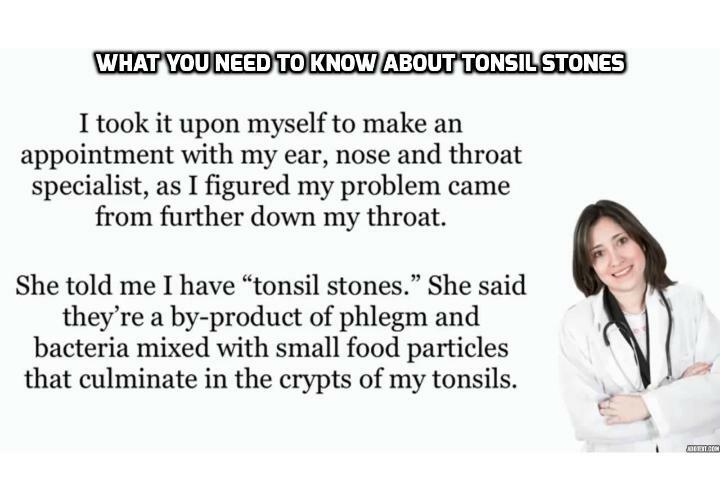 He or she can help dislodge any visible tonsil stones and can suggest helpful at-home remedies to reduce your symptoms. Alternatively, troublesome tonsilloliths that are not easily removed may require a visit to an ear, nose, and throat (ENT) specialist for further evaluation and possible surgery. Previous PostPrevious What are the Common Causes of Tonsil Stones?